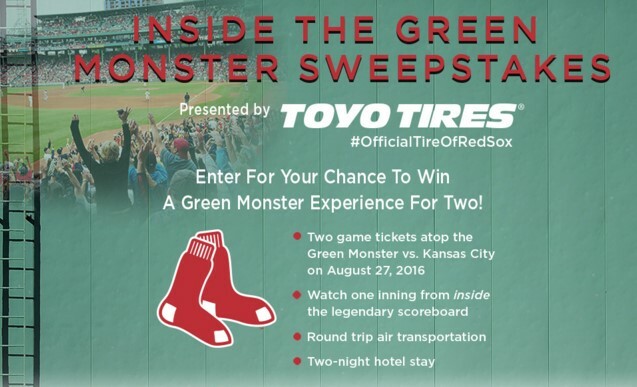 Toyo Tires is MLB's official tire of the Red Sox and they want you to enter once for a chance to win a vacation for two where you'll get to watch a baseball game from INSIDE the scoreboard! The Winner will receive two (2) atop the Green Monster tickets for Winner and one (1) guest for the Boston Red Sox home game scheduled to be played on August 27, 2016, at Fenway Park; the opportunity for Winner and his/her one (1) guest to watch one (1) inning of the game from inside the legendary scoreboard; round-trip coach air transportation for Winner and his/her one (1) guest between the major airport nearest to Winner's residence in the U.S. and Boston, MA; standard double-occupancy hotel accommodations (one (1) room) for two (2) nights in Boston, MA; and ground transportation to/from the airport and the hotel (collectively, the "Prize"). Approximate Retail Value of the Prize: $3,300. This Sweepstakes ends on 06/10/16 and you can ENTER ONCE to win.